Snowbird, Utah — When champions are made, it is a momentous occasion that is often heralded by the alignment of stars in the heavens. Notable events such as this are often marked by women becoming prone to weep with joy and children singing songs about it for years to come. 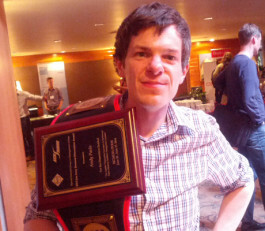 In this vein, the CMU Database Group is proud to announce that their very own Prof. Andy Pavlo has won the 2014 SIGMOD Jim Gray Doctoral Dissertation award. This prestigious honor is conferred for the best dissertation in the field of databases for the previous year. Andy’s thesis, entitled “On Scalable Transaction Execution in Partitioned Main Memory Database Management Systems”, is based on the H-Store database project. The prize was shared with Aditya Parameswaran from Stanford. The awards ceremony is on Thursday, June 26 from 8:30-10:00am held at the 2014 SIGMOD Conference. Congratulations, Andy! We are truly in awe of your presence.